Forest Hill resident Jeannie Tinklin and entertainer Dai Bassett share a moment during the home’s Jan. 25 Robbie Burns Day celebration. 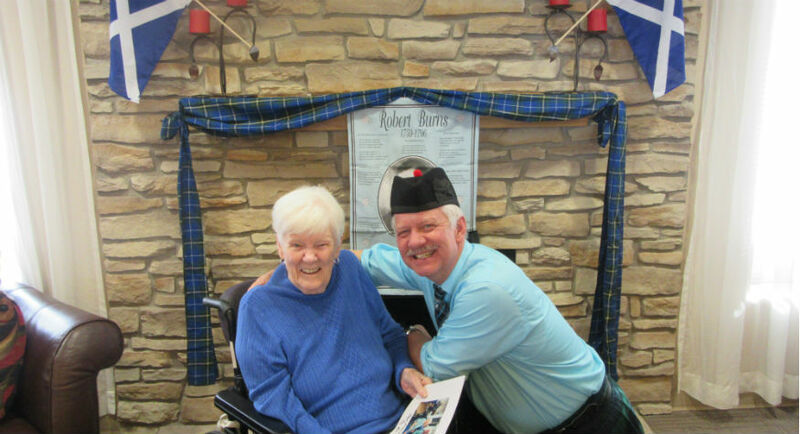 Forest Hill hosted a fun day of all things Scottish Jan. 25 during the Kanata long-term care home’s annual Robbie Burns Day celebration. 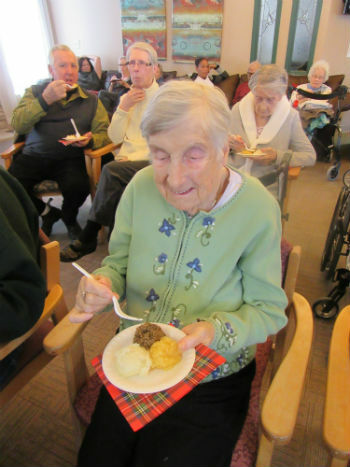 Forest Hill resident Margaret Cope tucks into a plate of haggis, neeps and tatties. Robbie Burns Day, which is commonly celebrated in long-term care homes, marks the birth of poet Robert Burns, who is best known for his poems A Red, Red Rose; The Battle of Sherramuir; and Auld Lang Syne. The centrepiece for the event was a haggis, the traditional Scottish meal served at “Burns suppers”. Haggis consists of minced sheep’s organ meat, suet, onion, oats and spices. The mixture is baked in a sheep’s stomach. Life enrichment co-ordinator Craig Forrest notes that this was “authentic haggis” bought at a local Scottish store. In keeping with tradition, the haggis was served with “neeps and tatties” (mashed turnip and mashed potato). Before the haggis was served, entertainer Dai Bassett read the Burns poem Address to a Haggis. He also performed a variety of Scottish folk songs for residents. Craig notes there are several Scottish residents living at Forest Hill who particularly enjoyed the Burns Day celebration. Burns, affectionately known as “the Bard,” was born Jan. 25, 1759, in Alloway, Scotland, and people across the Commonwealth and around the world celebrate his birthday each year.